His Highness Sheikh Mohammed bin Rashid Al Maktoum, Vice-President and Prime Minister of the UAE and Ruler of Dubai, accompanied by Sheikh Hamdan bin Mohammed bin Rashid Al Maktoum, Crown Prince of Dubai, has launched the construction of the Dh394 million Shindagha Bridge Project, which features an iconic design based on the concept of the infinity sign. The Shindagha Bridge is part of the Dh5.035 billion Shindagha Corridor Project extending 13 km along Sheikh Rashid Street as well as Al Mina, Al Khaleej and Cairo Streets. On arrival at the launch venue, Sheikh Mohammed was received by Mattar Al Tayer, Director General and Chairman of the Board of Executive Directors of the RTA, along with several senior officials of the RTA. 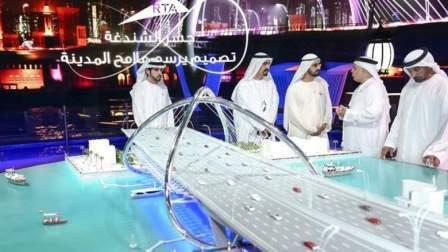 The launch of the Shindagha Bridge project was attended by Sheikh Ahmed bin Saeed Al Maktoum, Chairman of Dubai Civil Aviation Authority, Chief Executive of Emirates Group, Sheikh Ahmed bin Mohammed bin Rashid Al Maktoum, Chairman of the Mohammed bin Rashid Al Maktoum Foundation, and Sheikh Mansour bin Mohammed bin Rashid Al Maktoum. Briefing Sheikh Mohammed, Mattar Al Tayer said that the new bridge is being developed under the third phase of the Shindagha Corridor Project, following the completion of the first two phases. The bridge extends about 295 m, 150 m of which is over the Dubai Creek, and consists of six lanes in each direction in addition to a pedestrian crossing. The Bridge rises 15.5 m above the water level, which allows the passage of various types of boats plying the Creek. The bridge's iconic design features an architectural arch shaped in the form of the mathematical symbol for infinity. The top of the infinity arch rises 42 m. About 2,400 tons of steel will be used in the construction of the bridge. Sheikh Mohammed drew the infinity sign of the bridge on an electronic screen, following which a mammoth design of the Bridge was unveiled, heralding the start of construction works for the Al Shindagha Bridge. Phase IV of the Project covers the construction of the extension of Shindagha Bridge. It includes the improvement of Al Khaleej Street along with its intersection with Abu Hail Street, and the improvement of the intersection of Sheikh Rashid Street with Jumeirah Street, Al Mina Street and Al Mankhoul Street. These works require the construction of bridges stretching 3.4 km, tunnels running 2.25 km, seven surface junctions, and roads extending 5.1 km. This phase is expected to be completed by 2025. Phase V, which covers the construction of Deira Southern Island, with bridges spanning 1.5 km, is expected to be completed by 2027. During his visit, Sheikh Mohammed and his entourage also watched a movie on the Al Shindagha Bridge Project which meets the needs of mega development projects in the surrounding areas such as Deira Plam Island, Dubai Waterfront, Rashid Port, and the Dubai Maritime City.